Vitamin E is the primary lipid-soluble antioxidant in human biology, required for free radical protection of structures having high lipid content such as cell and organelle membranes, lipoprotein particles, and the central nervous system environment. Clinical research has discovered specific functions of vitamin E for supporting immunocompetence, optimal circulation and joint health. 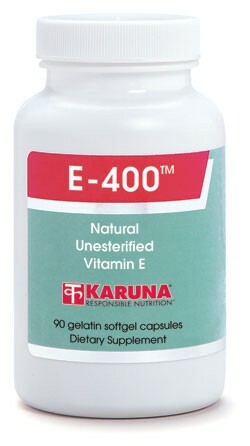 E-400 is a natural extract and supplies not only the primary alpha-tocopherol vitamer, but also the beta-, delta-, and gamma- vitamers, in order to more closely match the variety of forms found in the diet. E-400 is also unesterified, making it suitable for external use as well. Vitamin E is the primary lipid-soluble antioxidant found in the body. Natural vitamin E may be as much as twice as bioavailable as synthetic E (Am J Clin Nutr 1994;60:397-402). Vitamin E supplementation may support optimal protective highdensity lipoprotein (HDL) cholesterol level in some individuals (Isr J Med Sci 1987;23:869-72), and reduce the susceptibility of low-density lipoprotein (LDL) cholesterol to oxidation (Arterioscler Thromb 1993;13:1779-89). Vitamin E and other antioxidant micronutrients help maintain immunocompetence, especially in populations at risk such as the elderly (JAMA 1997;277:1380-6). Antioxidant or other functions of vitamin E apparently have beneficial influences on joint health (Z Orthop 1986;124:340-3; Z Rheumatol 1990; 49:369-73). Clinical research has demonstrated that vitamin E supplements support healthy circulation in the lower extremities, which helps maintain normal walking endurance in the elderly (Int Clin Nutr Rev 1984;4: 178-82). Suggested use for adults: 1-2 capsules daily, taken with meals, or as directed. WARNING: If you are pregnant, nursing, taking any medications, or planning any medical procedure, consult your doctor before use. KEEP OUT OF REACH OF CHILDREN.